Parthenon. The shows they put on for better healthcare always feature local talent depending upon where the bus happens to be. So far it’s been to 41 cities all over the U.S.
“Last April I walked into a doctor’s office with a nagging cough and I walked out with a stage-four cancer diagnosis,” said Laura Packard. Six months of chemotherapy and a month of radiation saved Packard’s life. “It cost about a million dollars to keep me alive and that’s money that most of us just don’t have,” she said. Packard said that without the Affordable Care Act, aka Obamacare, she would be bankrupt or dead. She has been to 24 states on the bus and travelled 11,000 miles to hold the elected officials who tried to repeal the ACA accountable. “And we know they will do it again. So everybody needs to pay attention and make sure you are supporting the elected officials who are supporting us,” she said. 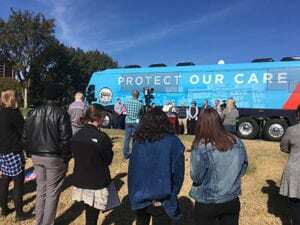 Care Force One, the Protect Our Care tour bus pulled into Nashville’s Centennial Park October24 and held a short briefing before heading off to Richmond. because the leadership on the other side has stopped that proposal from advancing in those chambers,” said Sen. Jeff Yarbro (D, Nashville). When state legislators refused to expand Medicaid in 2015, they turned down $26 billion in federal funds that would have insured 381,000 Tennesseans. There are about 163,000 residents who remain ineligible for Medicaid today and who don’t qualify for subsidies in the health exchanges. This is called the coverage gap. Thirty-four states did expand Medicaid and Tennessee still could if Republicans didn’t control both houses of the state legislature. “The stakes could not be higher and this is the time to put politics aside. This is not about red and blue. It’s not about Republican or Democrat. 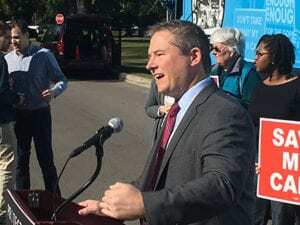 It’s about peoples’ lives,” Yarbro said. Joe Sheeran is a leading Tennessee health care advocate and he outlined the big picture. “Six months after voting to take away our healthcare, Republicans voted for a massive trillion-dollar tax cut to benefit the largest pharmaceutical companies and wealthy Americans at the expense of everyday Tennesseans. Then they put an anti-health justice on the Supreme Court who could overturn these essential protections that Tennesseans of all backgrounds depend upon,” Sheeran said. 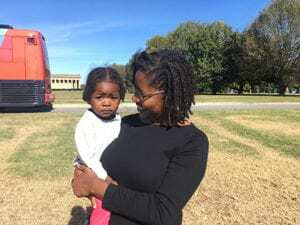 “Technically, she was a pre-existing condition before she was even born,” said Kathleen Jones about her 2-year old daughter, Tiffany. elections, ahead of jobs, gun policy, immigration, and taxes. An October 22 Rasmussen poll found 55 percent of likely voters consider health care a very important issue. And a Kaiser study, released October 22, found health care remains voters’ top issue, especially in bellwether Congressional races in Nevada and Florida. 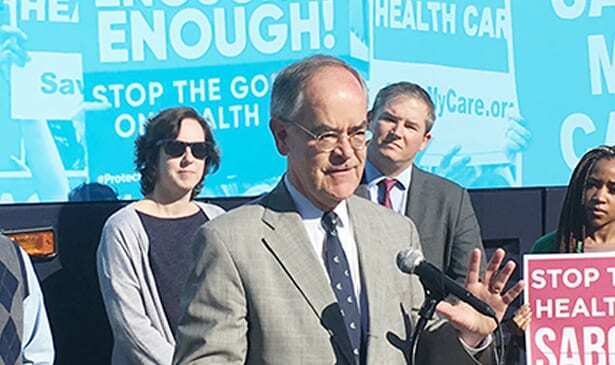 “Everyone needs health insurance,“ said Rep. Jim Cooper (D-TN 5th District). Cooper said you can’t get very far towards life, liberty, and the pursuit of happiness without your health. He said everyone should have health insurance as good as what Congress gets. “Insurance companies have been discriminating against us for a long long time and we shouldn’t take it anymore,” Cooper said. Kathleen Jones is the mother of Tiffany Jones, 2, who was born with half a heart and no pulmonary arteries. She had a heart catheter operation when she was four days old and open- heart surgery at six months. Today she is a happy animated little girl whose parents spent countless nights in the ER at the Vanderbilt Heart Clinic during the first year of her life. “Technically, she was a pre-existing condition before she was even born,” said Jones. The thought of Tiffany not being covered under the ACA is frightening. “I am here today to ask Attorney General Slatery to reconsider your position and think about the people in Tennessee. 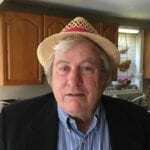 You are here for us so please reconsider hour position on repealing the Affordable Care Act,” Jones said. The “Protect Our Care” mission: stop the Republicans from repealing Obamacare. Their message: vote for candidates who will protect the coverage we’ve got now, especially health services for people with pre-existing medical conditions like diabetes. The next stops are Richmond, Virginia and Raleigh, North Carolina and then Atlanta on October 26. The tour will finish November 2 in West Palm, Florida.